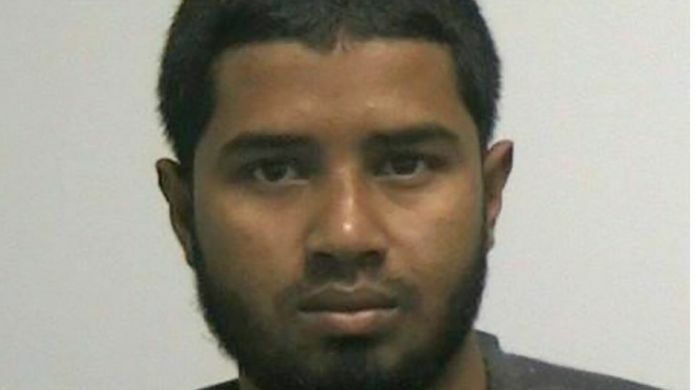 A Bangladeshi immigrant who let off a makeshift pipe bomb close to a busy bus terminal in New York City has been convicted of terrorism charges. Akayed Ullah, 28, set off the bomb during morning rush hour last December, causing himself serious burns but only lightly injuring five others. Prosecutors said he told investigators he had done it on behalf of the militant Islamic State group (IS). It was described in court as a "lone wolf" terrorist attack. Ullah targeted an underground passageway near the Port Authority bus terminal in Manhattan - the busiest in the world - on 11 December 2017. His defence team argued that he had only wanted to kill himself in the attack. Ullah denied the charges in January. "This case is not about a foreign terrorist organisation planting an operative in our midst," his lawyer, Julia Gatto told jurors. Her client was "a deeply troubled, isolated young man who wanted to take his own life". Prosecutors rejected that claim, reminding the court that he had strapped a bomb to his body designed to harm others and citing propaganda found on his computer showing he was a follower of IS.